Head down Hwy 31 towards Kerens, Texas and you can’t miss Purple Anvil Metalworks, where junk metal becomes one of a kind art. Whether you want metal art or a metal structure such as a gate, sign, trestle or bridge, the owner, Diane Billingsley, can design and weld it. From the first time she visited a blacksmith’s shop as a child, Diane had wanted to work with metal, but welding wasn’t considered an ideal career path for women. Instead, she became a registered nurse. Then, in 2007, Diane saw an opportunity to start her metal art welding shop and with her husband, Rickey, purchased the land and buildings where the business is currently located. The property came with a 60 year old pole barn that was located right off Hwy 31 and highly visible to motorists passing through Kerens. Behind the barn was where Diane’s welding shop was located along with a yard full of ongoing projects. During her first year in business, Diane had attended a SBDC class, How to Start a Small Business, but as the business began to grow, she recognized the need to market her products more effectively to the different types of customers she served. Diane again contacted the SBDC and met with the director, Robin Lasher. During a meeting, which included Marsha Thomas owner of a neighboring business, Rental Solutions, the three brainstormed several ideas on how Diane could more effectively market her business. 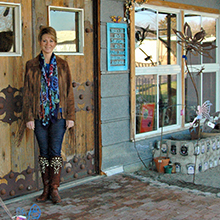 With the barn easily visible from the street, Diane was encouraged to cover the side of the building with corrugated metal, use her artistic skills to paint a mural and place larger items of her artwork out front that would quickly get the attention of passing motorists.